Petrol prices could skyrocket in the coming weeks after a steep incline in wholesale oil prices caused by the effects of Hurricane Harvey. 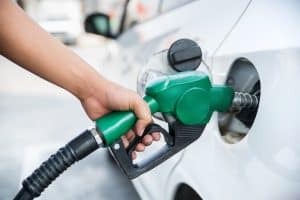 This is according to the Petrol Retailers Association (PRA), which noted a 4p per litre hike in wholesale costs in just five days – an increase that will surely be passed on to motorists over the next few days. As a result, the price of petrol could overtake diesel for the first time in a year, the RAC has warned, with average prices set to climb above 121p per litre. This would represent its highest level since 2014 and it remains unclear just how much more it could rise. Diesel, meanwhile, is predicted to sit at around 118.5p. An RAC spokesman was confident that the price of unleaded petrol would “leapfrog diesel early next week”, rising by up to 4p per litre. This was down to the impact of Storm Harvey that forced large refineries in the Gulf Coast to close, driving up US demand for petrol imports. As it stands, a quarter of North America’s refining capacity remains offline, which has resulted in a shortfall of over four billion barrels a day, and crude oil production in the Gulf of Mexico is down 13.5 per cent. This has led oil traders to redirect fuel to the US ahead of the busy Labor Day weekend and its usual surge in travel. Hurricane Harvey has claimed at least 33 lives in eastern Texas so far with more than 50 inches of rainfall in the past week.